October 07, 2016, 11:05 a.m. Speculation abounds in the media that former prime minister Tony Blair might be planning a return to politics. Asked in an interview with Esquire magazine about whether he can see himself returning to politics, the three-time election winner said: “There’s a limit to what I want to say about my own position at this moment. All I can say is that this is where politics is at. The answer – should Blair care about Labour getting elected again – certainly does not seem to be that he should try to wrest back control of the Labour party. YouGov research conducted in August found that, at that time, switching the leadership of the Labour party from Jeremy Corbyn to Tony Blair would bring Labour voting intention down from 21% to just 15%. Stripping out those who would not vote or don’t know who they would vote for, this translates to a drop from 27% to 20%. The return of Blair would see large numbers of voters fleeing from the Labour party for the Greens and Liberal Democrats. 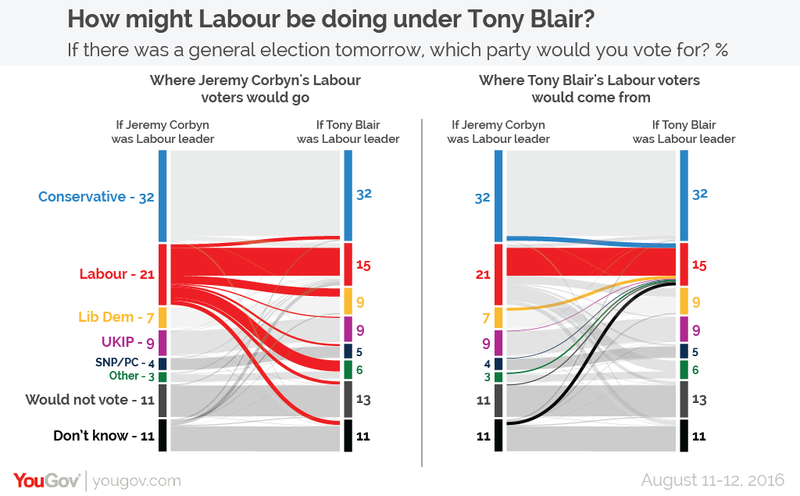 In return, Blair would be able to bring in a few new voters from the Conservatives, Lib Dems and from among those who don’t know who to vote for if Corbyn was leader – but not nearly enough to offset those voters that leave. It is worth pointing out the caveats at this point. People are not necessarily very good judges of how they would respond in hypothetical situations and - at this point at least - this is a completely hypothetical situation. Tony Blair is not leader of the Labour party and in the current climate is unlikely to be so again. The results do not represent firm predictions, but do nonetheless provide an interesting broad look at what the outcome might be.